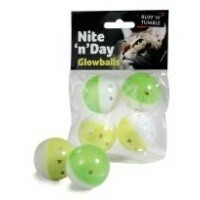 Nite 'n' Day Cat Glowballs (Pack of 4) are exciting and fun toys that your cat will spend hours chasing around. Your cat will love to bat this ball around in the dark as they have a cool glow in the dark exterior! The balls also have an internal bell which will provide your cat with hours of amusement.